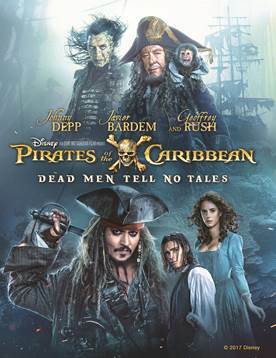 Walt Disney Home Entertainment is releasing the fifth installment in the PIRATES OF THE CARIBBEAN franchise on Tuesday, October 3. Fresh Fiction has some digital codes to give away. Information on how to get your code for DEAD MEN TELL NO TALES is below, along with all the information on the release. The rules are simple: Email preston@freshfiction.com with your name and full mailing address. Title your email subject: “Fresh Fiction PIRATES Giveaway.” The giveaway is active now until next Monday, October 2 at noon, central time. o A Return to the Sea – Two talented filmmakers, Joachim Rønning and Espen Sandberg, team up to bring “Pirates of the Caribbean” back to the screen. Hear how this new chapter of the tale was developed. o Telling Tales: A Sit-down with Brenton & Kaya – Meet Brenton Thwaites and Kaya Scodelario, the young actors behind Henry and Carina. The two sit down together for a revealing conversation on becoming a part of the “Pirates of the Caribbean” film franchise and its continuing legacy. o The Matador & The Bull: Secrets of Salazar & The Silent Mary – Oscar-winner Javier Bardem reveals more about his menacing new character and the foreboding ship he helms. o First Mate Confidential – Go on-set along with Kevin McNally, the affable actor behind the feisty Mr. Gibbs, Captain Jack’s reliable first mate from all five movies. o Deconstructing the Ghost Sharks – Peer below the depths at how these ferocious, mythical monsters were designed and brought to life. o Wings Over the Caribbean – Captain Jack has a memorable encounter with Sir Paul McCartney – rock ‘n’ roll royalty. o An Enduring Legacy – Take one more look at the “Pirates of the Caribbean: Dead Men Tell No Tales” experience and the impact of “Pirates of the Caribbean” — the movies, the ride and beyond.